The FDA posted new draft guidance for pharma wholesale distributors and third-party logistics providers to follow to meet their obligation to register their licensing information annually. The new requirement is from the Drug Supply Chain Security Act (DSCSA) that was enacted last year (see “It’s Official, President Obama Signs H.R. 3204, DQSA, Into Law“). The draft guidance explains who, what, when and how companies must report. The FDA will make the data reported available to the public through a web site at some point in the future. 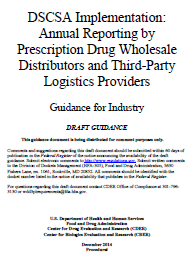 The information the FDA will collect as part of the report from both wholesale distributors and 3PLs include facility location and contact information, a unique facility identifier, license information for each State–including expiration dates–and any significant disciplinary action brought against them. Wholesale distributors should submit their initial report between January 1, 2015 and March 31, 2015. Third-party logistics providers should submit their initial report between November 27, 2014 and March 31, 2015. Either type of entity that receives a new State license should report to the FDA within 30 days. This new draft guidance is must-reading material for wholesale distributors and 3PLs, but is probably not that important to everyone else, except that the information will be available on the internet for use in determining which wholesale distributors are “authorized” under the DSCSA. Being a draft guidance, the FDA has opened a docket to collect feedback from interested parties through February 9, 2015. However, everyone should fill out the 2015 RxTrace U.S. Pharma Traceability Survey, sponsored by Frequentz. Click here to take the survey and watch for the results early next year.